Humans have been doing surgery for 10,000 years, and for most of that time, undergoing a procedure was an immensely painful, high-risk endeavor. But with the rise of advanced techniques in the last 150 years, modern surgery has become sterile, anesthetized, and often minimally invasive. So how has surgery improved more recently? Robots, of course. Robotic surgical tools are not only already here, they’ve been on the surgical scene for over a decade. 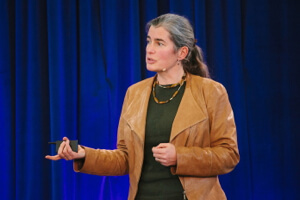 Catherine Mohr, Director of Medical Research at Intuitive Surgical, brought a da Vinci robotic surgical system to this year’s Exponential Medicine. We spoke with Catherine about the future of robotic surgery (the short version!) and got a tour of the machine. Intuitive Surgical’s da Vinci robotic surgical system was first introduced in 1999. Since then, surgeons have used the system to perform tens of thousands of surgeries in almost 2,000 hospitals worldwide. Intuitive Surgical is a publicly traded, consistently growing stock on Nasdaq. And a further testament to their success, the firm has made robotic surgery so commonplace it’s almost boring (until you see a da Vinci up close, that is). Da Vinci uses stereoscopic cameras to deliver a high definition 3D image of the operation to a surgeon sitting at a viewing station a few feet away. The surgeon slips his fingers into two control devices that relay his hand movements back to the robot. The machine’s robotic arms drive large motions, while the EndoWrist instruments mimic the rotational fine motor control of the wrist. These can be fitted with the various tools of the trade (retractors, forceps, etc.). Originally used primarily in prostatectomies, surgeons now use da Vinci in a wide number of operations, from removing tumors to heart surgeries performed without breaking the ribs. But these robotic procedures are largely old news (amazing as that is to hear). 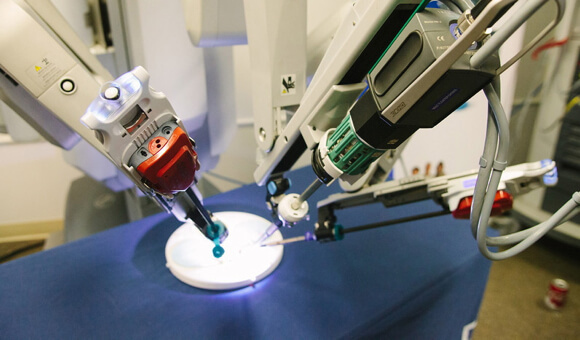 So, what’s next for robotic surgery? For that longer version of the future Mohr references in our interview, check out this lecture she gave recently at Carnegie Mellon. There are a number of firms working on improved robotic systems. Flexible tools like Olympus Corp’s EndoSamurai can maneuver in new ways to make procedures even more minimally invasive. Meanwhile, MRI-compatible robots like the University of Maryland’s Minimally Invasive Neurosurgical Intracranial Robot use MRI to keep track of tumors during brain surgery. Our future may also include robotic telesurgery, where the surgeon is not physically in the same room as the patient. Considering the significant regulatory hurdles even telepresence robots must navigate in healthcare, it might be a long time coming in the developed world. But telesurgery could have great utility in developing countries where skilled surgeons and patients are not as easily linked and regulations are a little softer. But, while these developments may improve current techniques, Mohr doesn’t believe robotic surgery itself is a truly disruptive technology. She likes to show a picture of tools excavated at Pompeii. Save a little rust, they would almost be at home in a 21st century operating room. Mohr uses cancer as an example. Many cancers are hard to diagnose early. By the time we do catch them, the tumors are large and necessitate major surgery. Robots are good and getting better at this. But these are just improvements on the same old surgery. The question isn’t whether we’ll have better robotic surgery in the future, but whether we’ll even have surgery in the future. The truly disruptive technologies will use biomarkers (signatures of disease at the molecular level) to make earlier and earlier diagnoses. Far before physical symptoms are present, cancer shows up in blood, saliva, and even our breath. 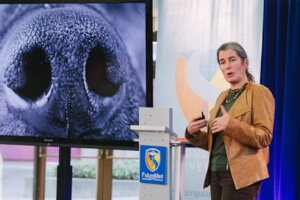 Mohr notes, some dogs can be trained to sniff out the disease. Robots will be forced to adapt—figuring out how to remove smaller and smaller tumors, for instance—instead of driving procedural changes. Eventually, treatments will attack the disease before surgery is even needed. Future health practitioners may use adenoviruses that selectively destroy cancer cells or nanoviricides that wipe out the viral step increasingly linked to many cancers. Similarly, viral or nanotechnologies could potentially address other major diseases well before surgery is required (our supposition not Mohr’s). So what happens then? Though Mohr admits we may have less life-threatening surgeries for awhile yet (knee replacements, for example), as the era of major surgery eventually declines, many of our big surgical robots will be contentedly rusting away in retirement—it’s an admirably flexible line of thought for the director of medical research at one of the biggest robotics firm in the world.